For over 20 years, sports fans have turned to the same place for news and highlights nightly at 11 p.m.: ESPN’s “SportsCenter.” From the golden era of Keith Olbermann and Dan Patrick forward, “SportsCenter” has been the gold standard of sports-roundup shows, even as its increasing emphasis on flashy graphics and faux spectacle has eroded a good deal of its watchability. The stage had been set for a genuine rival to the dominance of “SportsCenter.” Enter “Fox Sports Live,” the flagship show of the retooled Fox Sports 1, newly redesignated as a national channel. If ESPN is the CNN of sports news, Fox Sports 1, which premiered in August, intends to be its Fox News — the brash, opinionated competitor that leaves its stodgy competitor in the dust. Visually, “Fox Sports Live” looks much like Fox News. The screen is framed by the ubiquitous breaking-news crawl at the bottom and a list of upcoming topics along its right edge. The framing makes the main event feel unnecessarily cramped, and the blue-yellow-red color scheme is garish. Fox has been successful before with this brutalist look; regardless of one’s political outlook, it can be safely agreed that Fox News is one of the more visually unappetizing channels on cable. “Fox Sports Live” is similarly unpleasant to look at, like a primary-color oil spill seeping in from the edges of the screen. Onrait and O’Toole, who made names for themselves as hosts of TSN’s “SportsCentre,” are affable and clownish. For their American sojourn, they have packed suitcases full of shtick, like Onrait’s “You’re off the case, Bobrovsky!” whenever highlights feature Columbus Blue Jackets goalie Sergei Bobrovsky — likely a less common occurrence here than it had been in Canada. But Onrait and O’Toole control only a modest amount of real estate on the show, which also features Charissa Thompson and a slew of former athletes and moderators in an ever-changing array of formats. “Fox Sports Live” thinks that the solution to the monotony of two hosts sitting at one desk is to have 10 hosts at eight different desks, roundtables, and conversation pits. The result is a strange hybrid of news and opinion, in which the traditional highlight segments that make up a sports-news roundup are regularly interrupted by a variety of panels with names like “Let It Ride,” “Whip Around,” and “#failfriday.” Ex-athletes like Gary Payton, Donovan McNabb, and Ephraim Salaam are present to debate the issues of the day: Does Wichita State deserve to be #1? Is Johnny Manziel too short to be an NFL quarterback? Opinion is king, with former Eagles quarterback McNabb directly addressing the camera to call for the resignation of embattled Miami Dolphins head coach Joe Philbin. Intriguingly, “FSL” does not segregate its commentators by sport, giving us the unique pleasure of hearing McNabb discussing the intricacies of mid-major conference play in college basketball. “FSL” is attempting to re-create the good-natured jabbing of “Pardon the Interruption,” but none of the athletes are quite comfortable enough on air. One segment, starting a split second too early, caught former NBA superstar Payton yawning broadly before immediately feigning enthusiasm. “Fox Sports Live” also recalibrates the mix of sports coverage, unsurprisingly emphasizing less traditional sports like NASCAR and UFC to which Fox owns the rights. ESPN has always done the same, hyping and downplaying sports relative to the size of their television packages. (When was the last time you saw an extended hockey segment on “SportsCenter”?) Sitting through a 10-minute segment in which Thompson moderated a prefight trash-talk session between UFC fighters Patrick Cummins and Daniel Cormier gave this lifelong sports fan a sense of what it might feel like for a non-sports fan to watch ESPN: Who are these guys? What are they talking about? And why does anyone care? Onrait and O’Toole spent the last two weeks providing goofy, mostly unnecessary standup reporting from the Winter Olympics in Sochi. One segment on pin collecting suggested that the hobby was “a little like life: mildly depressing, with moments of real joy.” The same could be said of “Fox Sports Live,” which is often amusing, but feels strained because of its efforts to differentiate itself from its elder and superior, “SportsCenter.” With its dramatization of angry tweets by Seattle Seahawks wide receiver Doug Baldwin and its fake-infomercial vibe for an NBA trade deadline roundup, “Fox Sports Live” has a much-appreciated sense of humor, but could afford to be a bit less overplanned. ESPN has opened the door to competitors through its sheer dominance. 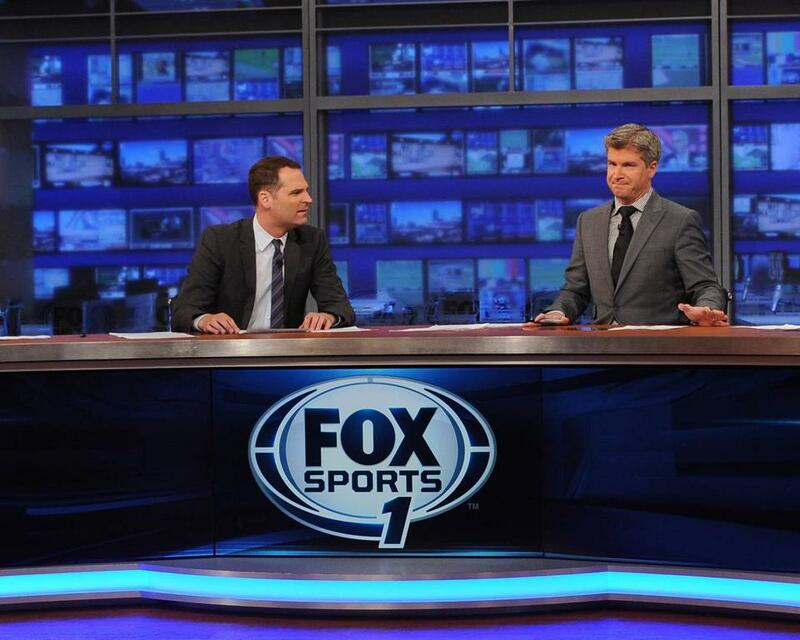 “Fox Sports Live,” for all its hard work, does not go nearly far enough in separating itself from the pack. Saul Austerlitz can be reached at swa204@gmail.com.